By Benjamin Habib, La Trobe University and Viktor Faulknor, La Trobe University. First proposed in September 2013, it is the signature foreign policy initiative of Chinese President Xi Jinping. It is a project of unprecedented geographical and financial scope. 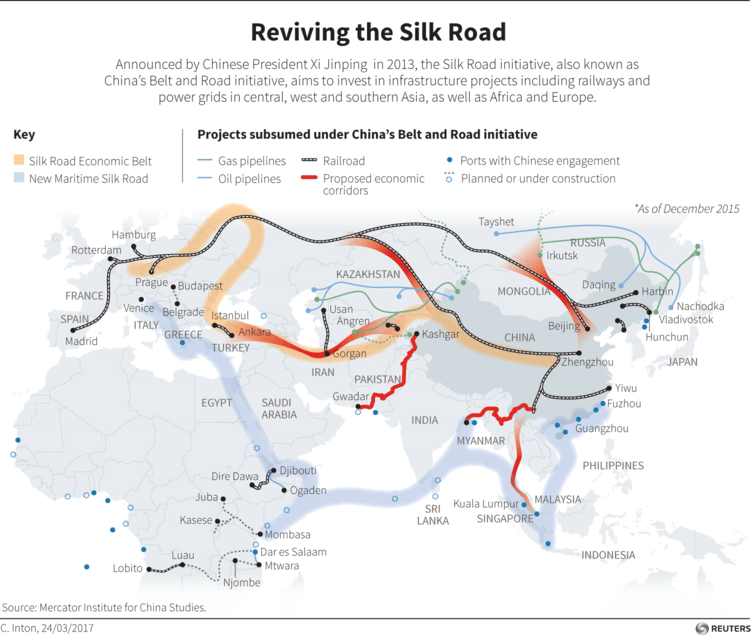 BRI has two primary components: the overland Silk Road Economic Belt (SREB), and the sea-based 21st-century Maritime Silk Road (MSR). Together, they form the “belt” and “road”. SREB’s overland infrastructure network encompasses the New Eurasia Land Bridge and five economic corridors: China-Mongolia-Russia; China-Central Asia-West Asia; China-Pakistan; the China-Indochina peninsula; and Bangladesh-China-India-Myanmar. The SREB’s connective sinews will be high-speed rail and hydrocarbon pipeline networks. The MSR is focused on developing key seaports that connect to land-based transportation routes. China has been at pains to emphasise the co-operative nature of the initiative and its objective of “win-win outcomes”. In his address to the Belt and Road Forum for International Co-operation in Beijing, Xi framed the BRI in terms of “peace and co-operation”, “openness and inclusiveness”, “mutual learning”, and “mutual benefit”. Yet behind the rhetoric of harmony and mutuality lies a substantive strategy for growing an emerging China-led operating system for the international economy. This could potentially succeed the US-led Washington Consensus and Bretton Woods system. Map of key trade corridors within the BRI. Source: Mercator Institute for China Studies. BRI projects are likely to increase China’s economic and political leverage as a creditor. China has established the multilateral Asian Infrastructure Investment Bank (AIIB) and the $40 billion Silk Road Fund. These are financial vehicles for BRI infrastructure projects, yet the vast bulk of funding to date has come from China’s big state-owned investment banks. The prospect of access to Chinese financial largesse to fund much-needed infrastructure investments has attracted attention from many prospective partner nations. Many of these appreciate the minimal political conditionalities that come with Chinese finance, in comparison to finance on offer from the International Monetary Fund, the World Bank, and the Asian Development Bank. The BRI has been viewed as a way for China to productively use its enormous, $3 trillion capital reserves, internationalise the renminbi, and deal with structural issues as its economy navigates the so-called “new normal” of lower growth. Perhaps foremost among these is the issue of industrial over-capacity. Having maxed out investment-driven growth through a frenzy of domestic infrastructure building following the 2008 global financial crisis, the BRI represents an international stimulus package that will utilise China’s idle industrial capacity and safeguard jobs in key industries such as steel and cement. This is a significant political dividend for the Chinese government. The Chinese Communist Party’s legitimacy rests on maintaining economic growth and improving people’s standard of living. In relation to energy security, the BRI will assist China in diversifying its energy sources through greater access to Russian and Iranian oil and gas. This will be achieved by linking with pipeline networks from Russia and Central Asia. By investing in pipelines from Gwadar, on the coast of Pakistan, to Xinjiang, and from coastal Myanmar to Yunnan, China also can diversify its transportation routes for maritime energy supplies. This reduces its vulnerability to energy supply disruption at maritime choke-points in the Strait of Malacca and the South China Sea. The establishment of port facilities in the Indian Ocean will also be advantageous to the emerging blue-water capability of the People’s Liberation Army Navy. This would assist in keeping vulnerable critical sea lines of communication open for maritime energy supplies from the Middle East. Collectively, these measures could reduce the ability of the US Navy to blockade China’s energy supply routes in any future conflict scenario. World leaders, led by Chinese President Xi Jinping, meet for the Belt and Road Forum in Beijing. Reuters. After more than a decade of conjecture about China’s increasing international assertiveness, the Chinese government has now clearly signalled its intention to assume a more prominent global leadership role through the BRI. China is aiming to spur a new round of economic globalisation, but in a changed international order that it has a pivotal role in shaping. The Asian Infrastructure Investment Bank, the BRICS New Development Bank, and the Regional Comprehensive Economic Partnership are the “software of integration” – the financial pillars of trade and investment in this vision. The BRI is the development vehicle – the “hardware of trade and investment” and the final pillar on which China’s claim to global leadership rests. Somewhat paradoxically, given the investment focus on hydrocarbon pipelines, the BRI also represents the vehicle through which China is likely to shape the contours of the emerging international post-carbon economy. The Paris Agreement in the UN Framework Convention on Climate Change is a keystone document in this respect. A combination of the climate emergency and market behaviours are making fossil fuel energy production increasingly uneconomic. This has spurred an accelerating transition away from fossil fuels and toward renewable energy generation. China is a world leader in green and alternative energy technologies. Through the BIR it is well-placed to be the dominant player in facilitating the transition and roll-out of renewable energy infrastructure across Eurasia. This is especially so since the Trump administration has ceded American influence in international climate politics through its repudiation of proactive climate policies. Leadership on international climate action is one area in which China can develop significant soft power cache, particularly with developing countries of the global south. China’s BRI announcement is also reflective of the relative decline of the US as the world’s pre-eminent power. 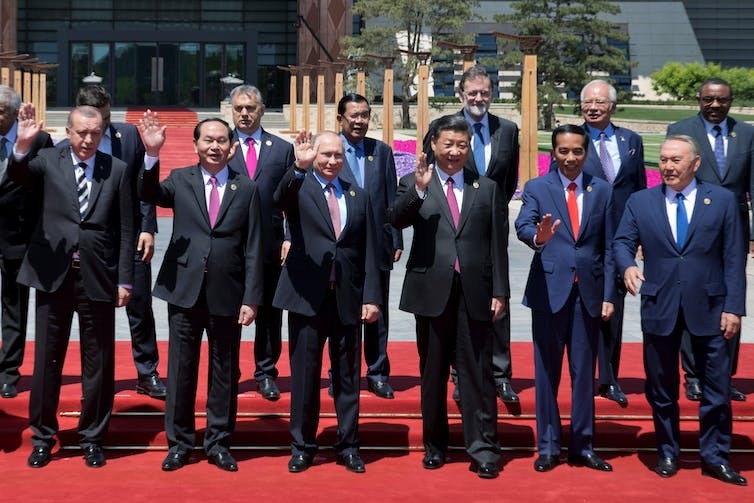 A declaration of intent as bold as that made in Beijing over the weekend at the Belt and Road Forum for International Co-operation would have been inconceivable prior to the 2016 US election. The Trump administration’s clumsy foreign policy manoeuvrings have damaged US prestige, weakened the integrity of a liberal international order already under duress, and opened a window for China to stake its claim. The BRI also signals a deepening of the Sino-Russian strategic partnership. This is based on a complementary supplier-consumer energy relationship and a mutual antagonism to the US. However, not all regional countries see the BRI as a boon. The Indian government has expressed reservations over the BRI’s China-Pakistan Economic Corridor and China’s Indian Ocean ambitions. The BRI now ups the ante for regional middle powers like Australia that have deftly attempted to hedge between the US and China. Australia’s foreign policymakers must weigh up the case for engaging with the BRI and having a seat at the table as China’s vision takes shape.